Infinite Group, Inc. (IMCI) is a leading national information technology (IT) solutions provider that is dedicated to freeing its clients from managing their in-house IT functions. In turn, clients focus on what’s most important to them: growing their own businesses. IMCI also discovers emerging technologies and invests financial resources to develop proprietary products, services, solutions, and applications. The company’s business model is structured to identify these technologies, hire experts in those fields; develop the best products and services to offer; and/or find best-in-class partners in those arenas; then reach new and existing customers to expand the company’s market presence. 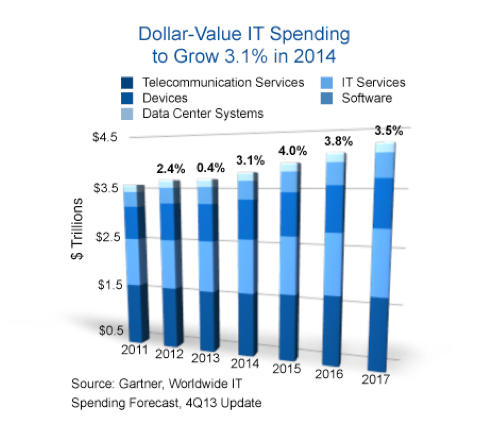 Worldwide IT spending is on pace to reach $3.8 trillion in 2014, a 3.1 percent increase from 2013 spending of $3.7 trillion, according to the latest forecast by The Gartner Worldwide IT Spending Forecast, the leading indicator of major technology trends across the hardware, software, IT services, and telecom markets. This follows a relatively flat rate of growth for 2013, which has been revised down to 0.8%, primarily reflecting exchange rate changes and a reduction in 2013 growth expectations for devices related to a reduction in mobile phone average selling prices. 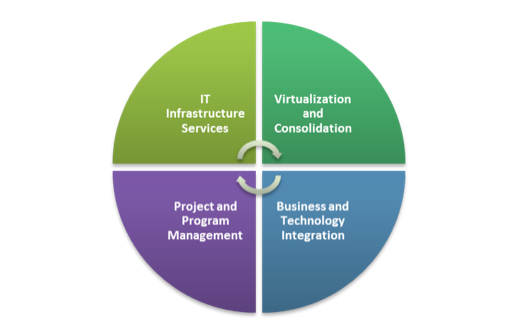 Over the past few years, there has been a change in the IT industry that includes a noticeable spending shift from capital spending (CAPEX) to scalable operations spending (OPEX); growing demand for faster data access, anytime and anywhere; increased need for mobile applications; advances in cloud computing and technology in general; and a robust corporate and economic environment for resource consolidation. Referable successes in realized cost savings for large enterprise, government (federal, state, and local) facilities operating in virtualization solutions and software-as-a-service markets. Maintaining focus on the expanding small-to-medium-sized business market. Ensuring up-to-date technical expertise and best practices in its team members. Partnering with best-in-class technology companies. Utilizing existing contract and sales vehicles. Capability to staff up rapidly as demands dictate. Experienced management team in growth and mergers and acquisitions. Infinite Group, Inc. professionals plan, integrate, manage, and support complete IT solutions for customers in small to medium-sized businesses (SMB), government agencies and large commercial enterprises. Dedicated to quality and customer service, the company’s team of more than 80 IT specialists are experts in their individual fields and maintain the latest certifications. The Quality Management System of Infinite Group, Inc. is also in conformance with the requirements set forth by ISO 9001:2008. The company’s scalable solutions cover the entire IT chain, including consulting and project management, data storage and recovery solutions, cybersecurity, managed services, and complete IT system development. With a single point of contact for all their IT needs, IMCI’s clients can then focus on growing their own businesses while Infinite Group improves IT efficiencies, reduces capital expenditures, and provides significant savings on operational costs. Infinite Group’s IT professionals deliver worldwide support to its customers on-site and remotely, and serve some of the premier businesses and government organizations in the United States. Each practice area is complementary to the other, allowing IMCI to utilize knowledge and experience across business segments to support each client’s developing needs. IMCI is developing business in the growing mobile application market space; the company currently offers app development services and has invested in a direct marketing deal platform that is unlike any other app in the market today. This new app, called goSudo, aggregates deals from trusted, high-profile Internet sites like Groupon, Living Social, Amazon, Restaurants.com, and others, and brings them to users in one customizable feed. One difference is that when users buy a deal through goSudo, they are paid cash directly into their accounts. goMerchant, goSudo’s Merchant Portal, is also unique in this market space, and provides direct control and advanced, actionable metrics that current deal apps do not offer to merchants. In close alignment with goSudo, goMerchant gives marketers direct control over marketing dollars. Merchants develop their own deals, control campaign targets and timing, discover potential new customers, manage loyalty programs, and directly engage their users on their mobile devices, all from one portal. IGI believes this powerful merchant marketing platform, combined with this unique user proposition, has the potential to make goSudo the go-to deal app for 2014. IMCI’s CyberSecurity Practice focuses on one of the most vital IT issues in today’s economy. With experience in providing clients with leading risk management, information assurance, and advanced strategies across a broad spectrum of requirements, IMCI introduces focused product and service offerings to its clients. The company works with leading security technology developers to implement solutions that provide protection, identification, detection, response, and resolution of potential threats and incidents for government, enterprise, and SMB. Support critical technologies for availability, reliability, and scalability. Proactive response to critical events through performance management. Use best practices and technology to deliver maximum performance with minimum costs. IMCI provides industry-leading IT experts to lead its architectural, validation, development, and deployment services that support computer and network infrastructure, tailored to each customer’s business requirements. IMCI ensures a high level of performance for each customer’s network and computing infrastructure through its Remote Server Management Services. Combining state-of-the-art tools, processes and technology with highly trained and experienced personnel, the company provides secure, ongoing remote monitoring and management of distributed computing environments that improve IT infrastructure’s overall availability and reliability. Virtualization is a powerful and economical solution that maximizes an organization’s ROI by enhancing computing resources while reducing many of the associated management and operational costs. This is accomplished by hosting multiple virtual computers on a single physical system. The virtual resources hosted on the hardware of this system can be dynamically shared with all users, allocating resources to different users as required. The result is that computing assets are more efficiently used and the number of physical machines and related IT hardware in the data center can be reduced, which leads to lower expenditures in power, cooling and equipment costs. IMCI provides tailored migration and design services and capabilities for moving legacy applications to state-of-the-art virtual machines. The company has a successful track record of managing enterprise data centers, and it is well-equipped to provide additional services such as training, operational process development and long-term support of the environment. IMCI has built a state-of-the-art Virtualization and Cloud modeling center that is used for proof of concept, briefing, and if needed, demonstration purposes. The company offers a comprehensive suite of solutions, enabling customers to leverage existing technologies while increasing resource efficiency, improving performance and maximizing security. IMCI serves some of the premiere businesses and government organizations in the United States with on-site national and worldwide support to its customers, which include the U.S. Postal Service, PepsiCo, Inc., the State of Mississippi, Home Depot, NASA, PricewaterhouseCoopers, the Florida Department of Financial Services, the U.S. Air Force, Navy, Army, and others. Personnel are located throughout the U.S. including Colorado Springs, Springfield and Vienna, Virginia and Washington, D.C. for added government support. Utilizing deep technical capabilities and experience, IMCI professionals help each client determine the right solution for their unique business needs and size. The company then delivers its services effectively and efficiently. IMCI is a trusted small-business GSA supplier for IT service and support. Leveraging technological expertise and industry-leading partnerships, IMCI can select and implement the best IT solution for agencies at all levels to improve efficiency, increase return on investment and achieve overall mission success. As an approved U.S. General Services Administration (GSA) supplier, IMCI is prepared to quickly commence work on federal contracts—with capabilities reviewed, rates negotiated, and prequalification determined. IMCI has obtained GSA approval on many schedules to best support government IT needs, including GSA Schedule 70 (GS-35F-0185P) and GSA Alliant (Small Business and Unrestricted). IMCI provides support to customers in Washington, D.C. as well as around the world including those in forward military locations. Headquartered in the Rochester, N.Y. area, IMCI has personnel throughout the U.S. including Colorado Springs, Springfield and Vienna, V.A., and Washington, D.C. for added government support. Temporarily supplementing customer in-house staff with IMCI personnel to meet contract requirements offsets higher costs of engaging permanent resources. With minimal impact on existing IT organization operating models, IMCI uses a simple pricing model (rate times hours worked) and can quickly scale up or down. IMCI has established long-standing partnerships with many recognizable industry leaders to ensure their customers receive the best solution possible for their specific needs. As one of the top VMware Partners in the country, IMCI is at the forefront of VMware design and implementation. Having delivered 300+ engagements for VMware Professional Services Organization (PSO), IMCI is qualified to lead each customer into achieving its business objectives through the use of VMware’s technology. IMCI leads a Pepsi International program to architect, design and implement the virtualization and consolidation of 63 datacenters to three global datacenters. This project is being delivered ahead of schedule and is using the entire suite of VMware products. IMCI is the program lead, with a 40-person team, delivering key virtualization, and operations and maintenance services to a Federal government agency program called Advanced Server Management (ASM) and Advanced Computing Environment (ACE) Program for Hewlett Packard (HP). These two programs provide server management and monitoring; installation and migration; Information Technology Infrastructure Library (ITIL) configuration management; capacity and performance management; and 24/7 remote administration. The program’s key tasks also include the virtualization and consolidation of 1,500 high-demand physical servers on 400 hosts using the VMware suite of products. IMCI has established an innovative virtualization and disaster recovery/COOP program for Department of Homeland Security; Customs and Borders Protection. Using a VMware virtual platform, IMCI created a fail-over environment that provided a robust and seamless transition of service during an emergency or crisis situation. IMCI is the sole awardee for the State of Mississippi Statewide Virtualization Services contract. This highly complex project involves developing an enterprise architecture and design for a broad based Virtualization and IT Modernization Initiative that will consolidate and virtualize servers to a new state-owned datacenter. The program uses VMware products. Under GSA ALLIANT Small Business, IMCI designed and is delivering a SIPR Thin Client and VMware View virtual desktop infrastructure across 12 bases for the Department of the Air Force, Air Combat Command. IMCI teamed with VMware, Inc. to deliver this program. With decades of experience and technical knowledge, and guided by the highest governance and business conduct guidelines, IMCI’s leadership team models and inspires each company employee to deliver the best services for every customer. Jim Villa assumed a series of executive assignments as a consultant to the company in 2003 and became president in February 2010. He became a member of the board in July 2008, joining the audit committee in 2008 and the compensation committee in 2009. In June 2012, he assumed the chairman of the board position. Villa earned a BS degree in electrical engineering from Clarkson University and gained more than 25 years of experience in finance and investment banking. He was previously the President of H.J. Meyers, a national investment banking firm. James Witzel joined IMCI in October 2004 as finance manager reporting to the then chief financial officer and assisted him with accounting, financial reporting, financial analysis and various special projects. Witzel went on to assume the position of CFO in May 2008. Prior to joining IMCI, Witzel provided accounting and management consulting services to a variety of privately held companies. He has more than 35 years of experience in accounting, financial reporting and management. Witzel holds a BA and an MBA from the University of Rochester. Scott Hogan joined IMCI in July 2004 as practice director and has provided IT consulting services including building and leading the implementation, integration, and support of technology solutions for one of IMCI’s major clients. Hogan became the COO in May 2008. Previously, he was employed with Hewlett Packard since 1997. From 2001 until joining IMCI in 2004, Hogan was HP’s North American operations manager for messaging services. Hogan holds a BA in Aeronautical Engineering CCAF and a BA in Information Technology Operations CSU. Hogan also has many professional certifications including Lean Six Sigma Black Belt, ITIL Expert, Program Management Certification, MS MCITP Certification, and CISCO CCNA. Hogan maintains several professional memberships including Colorado Springs Military Affairs Council, Air Force Association Lance P Sijan Chapter #125, United States Geospatial Intelligence Foundation, The American Society for Quality, Institute for Defense and Government Advancement, and the National Defense Industrial Association. Hogan is a United States Air Force Veteran. David Slavny joined IMCI in 2005 as director of business development. He oversees the activity of the company’s Federal Group, whose main focus is on the capture of Federal IT programs. Other responsibilities include managing the VMware professional services practice and overall business partner account management. Prior to joining the company, Slavny held sales and management positions in the financial service industry, serving as a branch and regional manager for HJ Meyers, Inc., Marion Bass, and JP Turner & Co. He also held the position of co-managing director of investment banking at JP Turner & Co. Slavny dedicates time to charitable activities, serving on the Sports Committee board of Al Sigl Center, The Equicenter and Cobblestone Creek Country Club. Dr. Allan Robbins became a director on the IMCI board in April, 2003 and is a member of the audit and compensation committees. Dr. Robbins is the medical director and chief surgeon at Robbins Eye Associates and Robbins Laser Site in Rochester, New York. He has also served as the CEO of the Genesee Valley Eye Institute. Dr. Robbins is a board-certified ophthalmologist and completed his fellowship training at the University of Rochester. He has been recognized and received the AMA Commendation for Continuing Medical Education as well as the America’s Top Ophthalmologists 2002-2003 Award from the Consumers Research Council of America. Dr. Robbins is a member of the New York State Medical Society, New York State Ophthalmologist Society, American Academy of Ophthalmology, American College of Surgeons, International Society of Refractive Surgery (ISRS), and the American Society of Cataract and Refractive Surgery (ASCRS). He was on the Scientific Advisory Council for Phoenix Laser and was a principal clinical investigator for the VISX laser during the FDA clinical trials. Donald Reeve was appointed to IMCI’s board in December 2013 and provides strategic guidance as the company continues to enter various commercial information technology markets. Reeve brings to the Board the experience of managing information technology requirements for a growing company in a competitive environment; he has also provided consulting services to Infinite Group on a part time basis. Currently, he is the principal partner at ReTech Services, LLC, a management consulting practice. Previously, Reeve was senior vice president and chief information officer for Wegmans Food Markets, Inc., where he managed an information technology staff of approximately 300 professionals with responsibilities for development, application and support services of computer technology. He held various positions of increasing responsibility for Wegmans from 1970 to 2012.